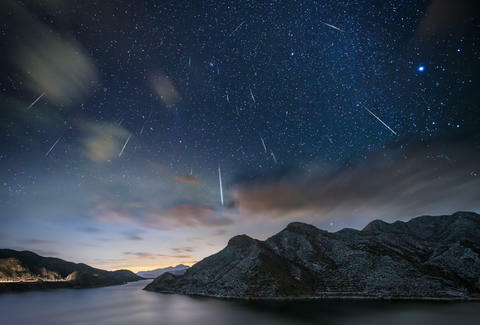 The Leonid Meteor Shower has produced the world's wildest meteor showers. That includes a meteor shower in 1833 so intense viewers thought the sky was on fire. It produced more than 100,000 meteors per minute, and people thought the rapture had arrived. This year, you probably aren't going to go outside and think the end is nigh. It's going to be a relatively standard showing, but that's still something to get excited about when it peaks November 17. The showers are active from early November through early December, but it'll be at its most vibrant the night of November 17 into the morning of November 18. One of the unique features of the Leonids is the speed of the meteors. "They're the fastest of all meteor showers," Bill Cooke, who leads NASA’s Meteoroid Environment Office, tells Thrillist. "Leonids move at about 45 miles per second. Blink and you'll miss them." This year, the Leonids will produce between 10 and 20 meteors of medium brightness every hour. Fortunately, the moon won't be bright and obstructing your view of the meteors that are coming down. Because of events like the storm of 1833, the Leonids are an important meteor shower historically. "The Leonids gave birth to meteor science," Cooke says. "It's because every 33 years or so it puts on this spectacular display." The biggest one in recent memory was 1966 when the Leonids produced thousands of meteors per minute. Unfortunately, you'll have to wait until 2032 for the next storm that could come close to replicating those numbers. The meteor shower gets its name because the meteors appear to emanate from the constellation Leo the Lion. Though, you don't need to find the constellation to see the meteors. You can see the meteors almost anywhere in the night sky. You'll find them after midnight on the night of the 17th, with some of the best viewing coming in pre-dawn hours of November 18. 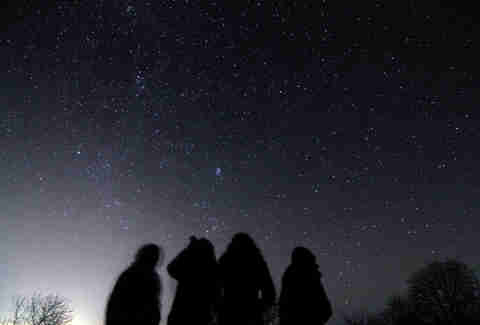 Enjoying a meteor shower, especially one that isn't producing a wild number of meteors per hour, takes patience. With the weather turning cold, it might make things a little tough. Bringing a thermos of hot chocolate or a hot toddy might help you out if you're watching in the colder reaches of the continent. In warmer months, the recommendation would be to get out to a place with clear sight lines of the sky, free from light pollution coming from the city. (This is a good tool for tracking down the best stargazing locations.) You may also want to check on the visibility in your area before heading out. You will also want to get there early enough to let your eyes adjust to the darkness, which can take a while. Then you need to have a little patience. Since it's a little chilly out, you'd be forgiven for deciding to stay in and tune into a live stream, like the one Slooh is hosting November 17 at 7pm ET.